Grow-Bed Gardening came out of the 60 years’ growing and teaching experience of Dr. Jacob Mittleider, which is unique in all the world, and this unique background has put his vegetable gardening books in a class by themselves. It has simple instructions and 740 pictures that will teach you every step to successful gardening. And here’s why this book is SO good! Download Chapter 10: Building an Inexpensive Seedling Greenhouse (PDF, 1 MB) and learn about what factors to consider in building your greenhouse. Twenty years as a commercial nursery grower, during which time he became well-known and highly respected in the industry, were just a beginning point for Jacob’s gardening training. He sold the business before he was even 45 years old and devoted his life for the next 40 years to helping people everywhere grow food more abundantly. He created hundreds of gardens and taught thousands of families in 27 countries how to become self-sufficient in their food production, and millions of people today credit their gardening success to the Mittleider Method of gardening. Whenever he wasn’t in a developing country demonstrating and teaching, Jacob was in his studio writing books and creating training videos. As a result, his materials are also used in many high schools and colleges around the world. Now, don’t let that scare you! Grow-Bed Gardening is not a college-level agriculture textbook. Another book, called Food For Everyone, with almost 700 pages, does that job very nicely. In this compact easy reading and thoroughly illustrated volume Dr. M. shows you the secrets of growing 5 to 10 times the fresh vegetables you’d get in a traditional garden. Today we’re faced with higher food prices, plus worries about what the big growers are putting into our food. With these methods, even a small fraction of an acre can provide enough to feed your family, with a surplus to share or sell. And we really want to improve our health by eating fresh, naturally grown vegetables and fruit without using pesticides or herbicides! After Dr. Mittleider’s years of research a simple fail-proof gardening method has been perfected. Your success with this method is not limited by anything – poor soils, rocks, hillsides, swamps, city limits, long seasons, short seasons, rain, arid regions, waste land, weeds, lack of powered equipment, or no equipment. The Grow-Bed Gardening method is simple, inexpensive, and easy to do. You will eliminate failures and experience the best in gardening satisfaction and enduring success. 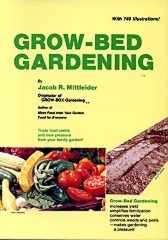 If you’d like to grow the healthiest and most tasty produce possible in your backyard garden, then Grow-Bed Gardening, by Dr. Jacob R. Mittleider is for you. Grow-Bed Gardening blends the best features of several major methods of gardening, including organic, conventional, and hydroponic into one simple, highly efficient, and enjoyable gardening experience. Hundreds of pictures and graphic illustrations teach all the gardening skills you need to grow a great garden – no matter what your soil or climate are like – while making learning quick, simple and pleasant. Grow-Bed Gardening is loved by many thousands of successful gardeners all around the world. It really is a step-by-step guidebook to Dr. Mittleider’s methods for use by the home gardener who wants to grow in the soil. Simple illustrated instructions are given for every step of the gardening process, and important secrets for increasing your yields of healthy crops by 5 to 10 times are provided as well. Grow-Bed Gardening can help you save many hundreds of dollars a year on your food bills. You’ll also save additional money because Grow-Bed Gardening shows you how to use less than half the water of a traditional garden. 1. Providing inexpensive balanced complete natural mineral nutrients, so plants achieve optimum growth, taste, and health. 2. Giving the plant access to all available soil nutrients and microbial activity below the container. 3. High-density planting in a controlled environment. 4. Vertical growing to maximize yields in a given space while eliminating losses from foot traffic, pests, and diseases. 5. Automatic watering to make the daily gardening chores easier, quicker, and more efficient. This book is a must-have for the home gardener with less than ideal soil who wants to have success without waiting years to “build up the soil”. Order Grow-Bed Gardening now, and learn the simple secrets of the Mittleider method of gardening that’s been taught and loved by millions of families for over 40 years around the world. And you’ll be pleased to know you are helping support the work of the Non-Profit Food for Everyone Foundation, which was set up to continue Dr. Jacob Mittleider’s work of teaching the best possible gardening methods to families throughout the world. I am pleased to write concerning our experience using the Mittleider Method of growing a large variety of fresh vegetables for the L.D.S. Welfare System . . . My personal feelings and those shared by my associates are, that the Mittleider Method is a most enjoyable means of growing food . . . The results are fantastically more rewarding than I have ever had in my 30 years of growing vegetables by conventional means. The production is heavier, quality higher, and the results more dramatic in every way. I am pleased to recommend the Mittleider Method to everyone for pleasure or profit. Dr. Mittleider knows one thing that can change the face of the earth, and he’s trying to get someone to listen. No matter how poor man, or man’s soil is, if there’s a way to get water to it, with only a plot of ground 20′ X 100′, a man can feed his family better than it has ever been fed before . . . He has proven his claims in just about every type of adverse situation in the world . . . The Idaho baker-turned-agricultural wizard, specializes in turning what is known as “devil-land” into unbelievably productive land. The beauty of the program is that the transformation can take place anywhere from three to six months, with food to spare and to share for the effort . . . There’s no reason why there is a single person in the world who has to go to bed hungry.